the downing-gross cultural arts center is a multi-purpose cultural space in the southeast community of newport news, va. the building is owned and operated by the parks, recreation and tourism department of the city of newport news. the center houses several event spaces and large/small group gathering rooms available for event rental. the core of the downing-gross cultural arts center is the ella fitzgerald theater, a 276-seat venue named for the “first lady of song.” other event spaces in the building include the anderson johnson gallery, the newport news community gallery, the l. marian poe meeting room, the banquet room, and the charles c. allen execute board room. the edifice was erected at the corner of 25th Street and Wickham Avenue as the Walter Reed School - a high school for white children. During a massive Spanish influenza outbreak, the first floor of the building was temporarily RE-PURPOSED as an emergency hospital. Soon after, it would return to operating as the segregated school. the population had increased rapidly, necessitating the construction of a larger high school - present-day Huntington Middle School. The Walter Reed School was then converted to a center for primary education. During it's time as an elementary school, the verdict of Brown v. The Board of Education allowed for the integration of Walter Reed. It remained open until 1971. "...a way to save our children through exposure to the arts." Utilizing the shell of the gutted facility, as well as additions for a total of 52,000 square feet, the firm of PMA Architects created a master plan to bring this to fruition. The renovation concept entailed a community-oriented cultural arts center, combining art studios, exhibition galleries, a performance theater, meeting rooms, a banquet hall and space for the Office of Human Affairs (currently the Hampton Roads Community Action Program). 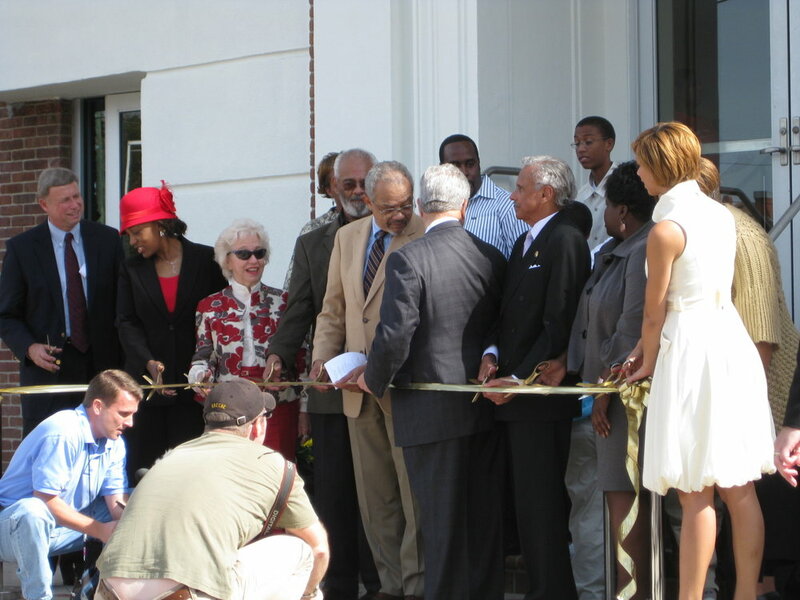 the idea became a reality as the Downing-Gross Cultural Arts Center opened its doors and has since been dedicated to building the community through the arts. Since it’s inception, dgcac has introduced a variety of programs to the southeast community including free and inexpensive classes and workshops, concerts featuring national and local acts, theatrical productions, and so much more. we are proud to be a part of the city of newport news. with such a rich history and vibrant culture, newport news is home to many other iconic spaces. learn more about them below. read more on the cultural icons of newport news.